"I just signed up Spotify music service but it appears I can only stream songs online within the free account? Must I upgrade to premium plan in order to play Spotify songs offline? Is there a powerful Spotify playlist downloader that can download Spotify music offline without premium?" As the largest streaming music site, Spotify is now providing more than 35 million songs to its whole free and premium users all over the world. 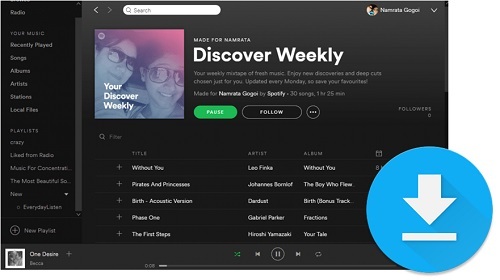 For free service tier, Spotify has experimented with different limitations to users' listening experience. To be specific, free subscribers are limited to listen to ads-supported Spotify music in lower quality with internet connection only. If one wants to download Spotify songs offline, he or she should subscribe Spotify premium account by paying $9.99 monthly. 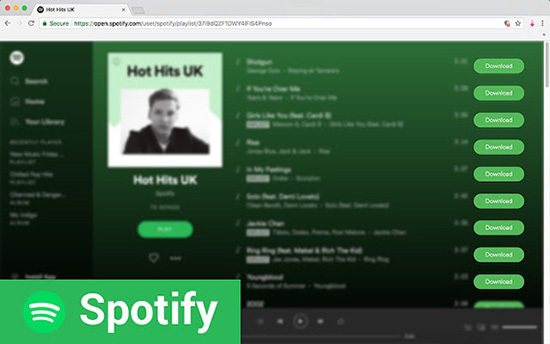 However, without having to join premium plan, you still get chances to download Spotify playlists with free account, since there are many smart Spotify downloaders that can accomplish the task well. To make it easier for you, we collected a top list of the 7 best 2019 Spotify music downloaders in the market. Just check them out, and then you can freely download any Spotify track, playlist or album as MP3 for offline listening on any device even without subscribing premium account. 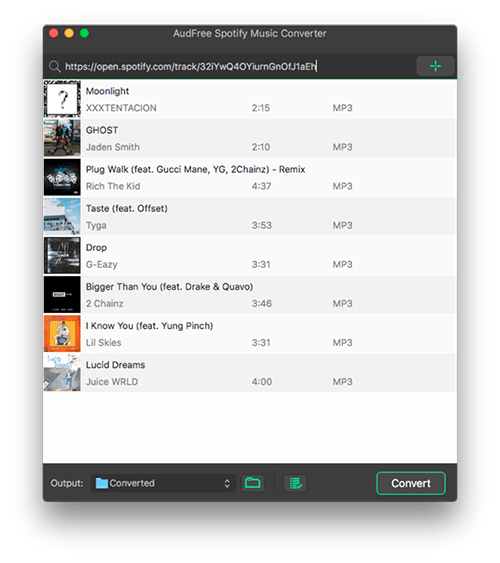 If you are seeking for a professional Spotify music downloading software, AudFree Spotify Music Converter could be the best option for you. As a combination of Spotify playlist downloader and converter, it is able to download and convert any music from Spotify to common MP3, AAC, WAV and other formats with no quality loss. No matter whether you are using free or premium account, AudFree Spotify Converter will enable you enjoy all Spotify music offline without ads on any popular MP3 player including Apple iPod, Sony Walkman, PSP and more. Besides, it operates at up to 5X faster speed due to the innovative DRM decrypting core. 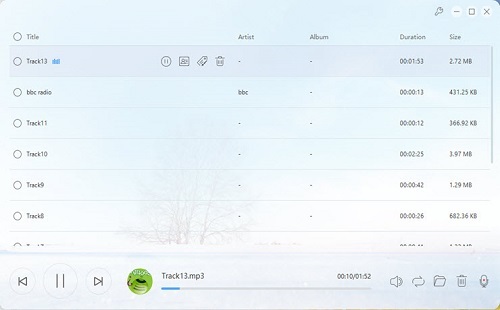 Better still, it can keep the original ID3 tags such as track title, number, artist, album, cover, etc. and allow you to edit output music quality by adjusting bit rate, channel, sample rate, and so forth. 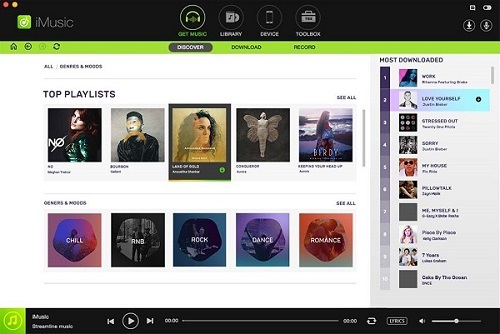 Unlike AudFree Music Downloader for Spotify which is a dedicated Spotify music downloader, iMusic is a complete music tool to download, record, and manage songs from Spotify and other 3,000+ music sites such as Pandora, Deezer, Tidal, Google Play Music, etc. With this comprehensive music downloader, you can not only download Spotify songs to MP3, but also add the offline music files to your iTunes library directly. If you need to transfer the songs between iOS devices without iTunes, iMusic could also be a great assistant. 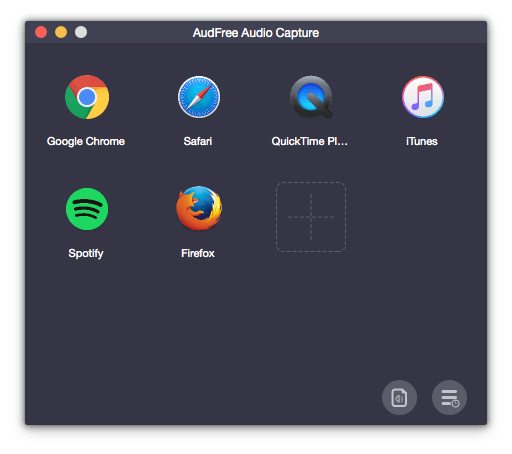 As another all-in-one audio recording tool, AudFree Music Recorder is also a top-rated Spotify music playlist downloader that can capture any song and playlist from Spotify while keeping the original music quality. Thanks to the advanced recording technique, it's able to capture multiple tracks simultaneously and divide the songs individually by intelligently detecting the gaps between each song. Once recorded, it lets you save the recordings to MP3, AAC, WAV, FLAC and other common formats so that you can play the Spotify music on any popular device in high quality. It also keep and fix ID3 tags of Spotify music automatically for you. Except for Spotify, it's capable of recording any other sound playing on your computer as well. All the above mentioned software are not free of charge. 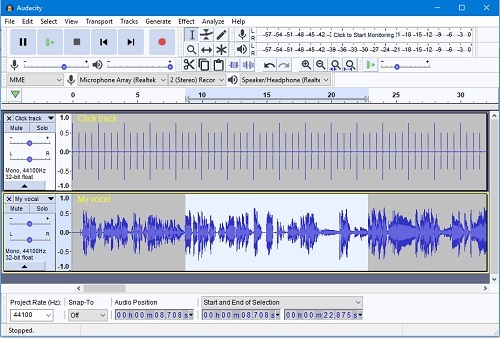 If you are looking for a freeware that can download Spotify playlists to MP3 2019 totally for free, you may like Audacity, a free streaming music recorder and editor. This free Spotify music downloader enables you easily download any Spotify playlist and track by recording the music as WAV or AIFF. With the built-in audio editor, you can also customize the music by adding pitch, bass, treble, or other special effects to make the songs more personalized. In addition to Spotify, it can also be used to record and download any music from any other streaming music source, like Tidal, Deezer, etc. You may need to get Spotify songs free download but don't like to install any extra software on your computer for security concern. No problem! In this case, Apowersoft Free Online Audio Recorder could be your best choice. With the help of this online streaming music recorder, you are able to download Spotify music as MP3 without installing the app. It only takes 3 simple steps to complete the whole recording process. What's more, it can not only record Spotify music, but also record high quality audio from computer sound card and microphone for you. As a well-know Google Chrome extension, Spotify Deezer Music Downloader is well designed for downloading audio tracks from Deezer and Spotify Web Player. It is totally different from the above five Spotify music downloaders and recorders working well with Spotify desktop client instead. This Spotify music downloader Chrome extension adds a 'Download' button to Spotify Web Player so that it's possible to download Spotify songs, playlists, etc. from Spotify directly. But it's important to note is that this Spotify Music Saver makes use of other MP3 library instead of Spotify itself to search music files and downloads them from. It could lead that some music tracks are not available. That's to say, you can't download as many as Spotify playlists you can. * Some Spotify tracks won't be downloaded. This tool is the same with Spotify Deezer Music Downloader as it's also a Chrome extension. But it also comes with some differences. 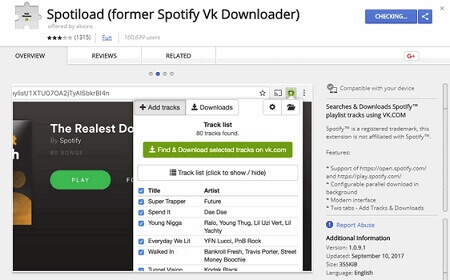 Spotiload (previously Spotify VK Downloader) is specialized in downloading Spotify tracks only and it's well designed for VK.com users only. As consequence, please make sure you are a member on vl.com social network. When you have discovered a loved Spotify music, Spotiload Spotify downloader will match the same name automatically. Once found out, it will start to download and save them as MP3 files for offline listening. * It's free of charge and easy to use. * Be compatible with multiple operating system. * It's not available in some countries. To sum up, AudFree Spotify Music Converter should be the best music downloader for Spotify as it's the most dedicated software specialized in downloading and converting Spotify songs for both free and premium users. If you are looking for a more complete music downloader for all streaming music services, iMusic or AudFree Audio Capture is the best alternative as it can download and record more types of songs from more resources. For you who prefer to free Spotify playlist downloader, Audacity and Apowersoft streaming music recorder are highly recommended. Besides, you can also try to use two free Chrome extensions, respectively Spotify Deezer Music Downloader and Spotiload to see whether it can also meet your special requirements. What Spotify music downloader are you using now? Do you have better suggestion? Let's hear your voice in the comments below.